By GreenEyedLillies on December 4th, 2008 . Filed under: Holidays, Home Decor . 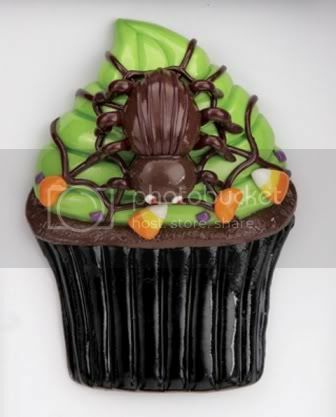 Spooky Spider Cupcake Magnet F has a black bottom with green frosting a brown spider and candy corns on the frosting. Magnets measure 2 x 3 inches; there are 6 different styled spider cupcakes.